Vinalhaven - "Fox Islands," Maine - Map showing location of quarries on Vinalhaven and adjacent islands, known collectively as "Fox Islands," Maine. Vinalhaven Island, which lies in Penobscot Bay, can be reached from Rockland by ferry. A massive body of pink granite underlies the central and southern parts of Vinalhaven. 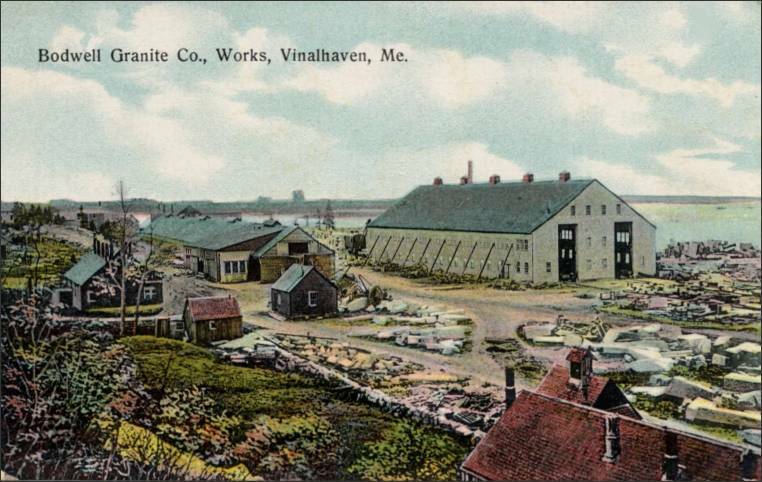 The granite of Vinalhaven was "quarried in the late 1800's and early 1900's as part of the famous Maine granite industry that provided dimension stone and decorative stonework for large buildings and bridges in Boston, New York, Chicago, and elsewhere." Today the granite quarries are inactive. 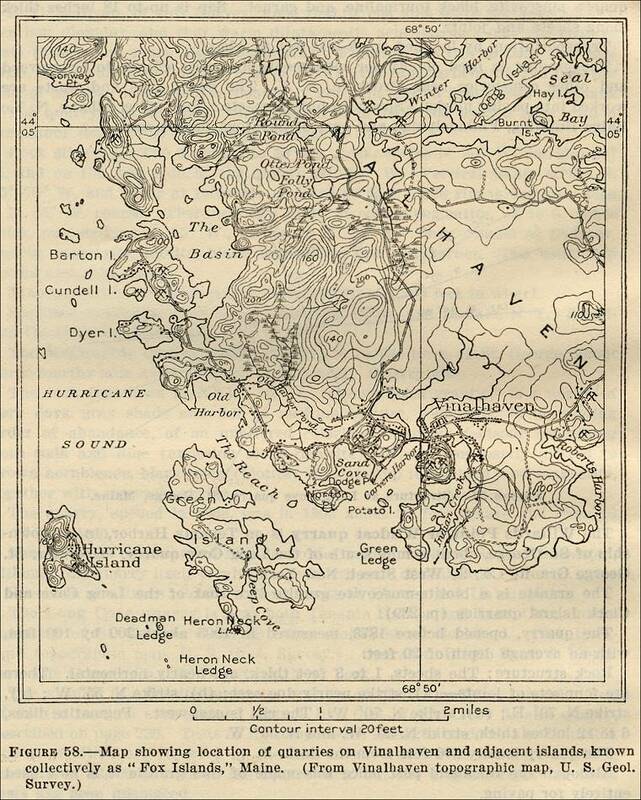 Vinalhaven and Hurricane Islands - Known as the "Fox Islands," from The Commercial Granites of New England, Bulletin 738, by T. Nelson Dale, U. S. Geological Survey, 1923. Vinalhaven and the adjacent islands have been known collectively as the Fox Islands, and their granite as "Fox Island Granite." The granite industry of these islands is distributed over an area about 5 miles from east to west by 4 miles from north to south..Some of them are near the center of Vinalhaven Island. The Palmer quarry is on the west shore; the Black and Webster quarries are on the east shore; the Sands, Harbor, and Armbrust quarries are on the south shore, near Vinalhaven village; and the Pequoit and Duschane Hill quarries lie east of the village near the east shore. 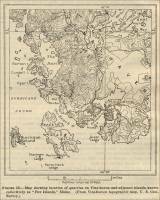 There are some minor quarries ('motions') on Barton, Cundell, and Green Islands, and a large quarry on Hurricane Island." Vinalhaven, Maine - History of Vinalhaven, prepared by the Vinalhaven Historical Society, August, 1995. Photographs of granite-quarry related subjects including: the Bodwell Granite Co.'s Stoneyard; the Paving cutting yard at the Leopold Quarry; A three-masted schooner loading paving at a small quarry on the island's northwest side c.1895; The big pit at the Leopold Co. of New York's paving quarry about 1915; and Granite carvers working on decorations for the monumental U.S. Customs House in New York City, 1907. Vinalhaven, Maine - Amherst Hill Quarries, colorized postcard photograph from the postcard collection of Freeman Fletcher Brown, Jr., in the "Dad's Postcards" section, on the Brown Log web site. Vinalhaven, Maine - the Armbrust Quarry, from The Commercial Granites of New England, Bulletin 738, by T. Nelson Dale, U. S. Geological Survey, 1923. This quarry was "in the town of Vinalhaven, between Carvers Harbor and Indian Creek, south of Vinalhaven village." The operator was the Crown Hill Granite Works in Vinalhaven, Maine. The quarry had "numerous openings on several sides of a hillock 100 feet high." Transport of the granite was by cart of 7 to 10 ton loads one-fourth to one-half mile to a wharf on Carvers Harbor. The granite from the quarry was used exclusively to make paving blocks. At the time of the report, the quarry had not been operated since 1907. Vinalhaven, Maine - the Black (Pleasant River) Quarry, from The Commercial Granites of New England, Bulletin 738, by T. Nelson Dale, U. S. Geological Survey, 1923. This quarry was located "in the town of Vinalhaven, on the south shore of Pleasant River, at the end of Winter Harbor, in the northern part of Vinalhaven Island." The operator was Joseph S. Black of Vinalhaven, Maine. The granite from the quarry reportedly was identical to the granite found at the Palmer Quarry. Transport of the granite was by a 350-foot track, with a grade of 10 feet, to the wharf. The Black Quarry opened in 1896. In 1905 the quarry measured 300 feet in a "N. 4O W. direction by 200 across with a working face 45 feet high." At the time of the report, the quarry had been idle since 1912. Granite from the Black Quarry was used for buildings and the waste for rip rap. Granite from this quarry was used in building the dry dock at Portsmouth, New Hampshire, and the Rain Island Lighthouse. Vinalhaven, Maine - the Bodwell Openings, from The Commercial Granites of New England, Bulletin 738, by T. Nelson Dale, U. S. Geological Survey, 1923. 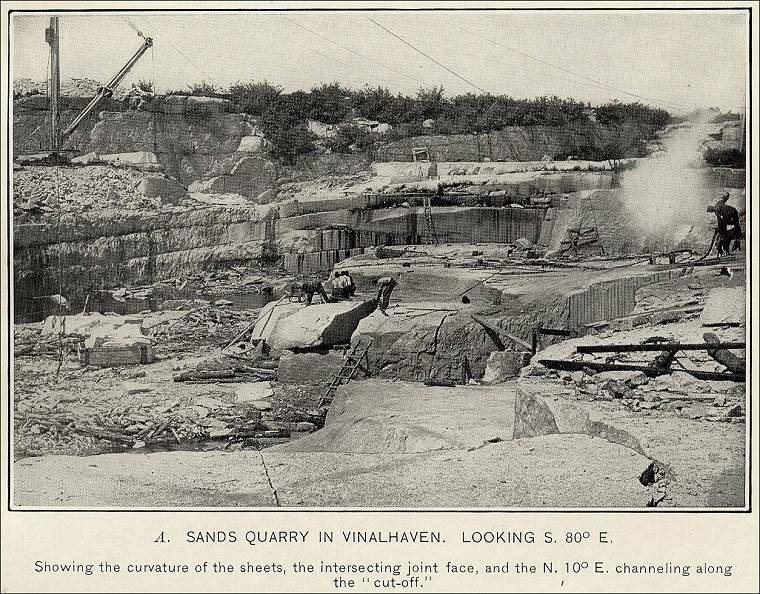 This quarry was "in the town of Vinalhaven, in the diabase area west of Sand Cove." The operator was the Bodwell Granite Co. of Rockland, Maine. Granite from the quarry was reported to be an "olivine norite of almost black shade and fine texture." Very large blocks are not obtainable. The quarry was idle in 1922. Vinalhaven, Maine - Booth Brothers and Hurricane Island Granite Co. In the Raymond H. Fogler Library (in Orono Maine), Special Collections, there is a collection of records of the Booth Brothers and Hurricane Island Granite Co. in the "Granite Industry and Trade" section of the online "Subject Index to Manuscript Collections" list. "Order forms for architectural granite" make up this collection. Vinalhaven, Maine - the Duschane Hill Quarry, from The Commercial Granites of New England, Bulletin 738, by T. Nelson Dale, U. S. Geological Survey, 1923. This quarry was "in the town of Vinalhaven, 1 1/4 miles east of Vinalhaven village, on Roberts Harbor." The operator was Roberts Harbor Granite Co. of Vinalhaven, Maine. The granite was reportedly a medium buff-gray color with a fine to medium texture. The granite from the quarry was used exclusively to produce paving blocks. 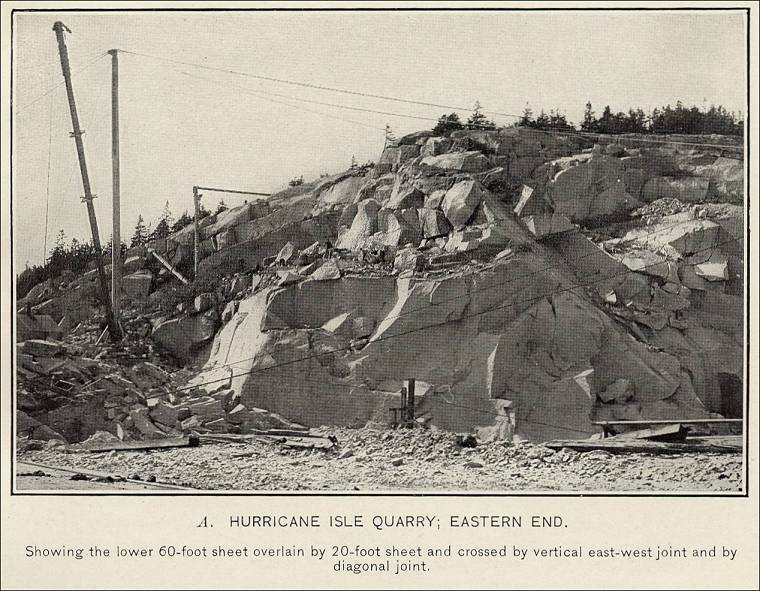 Vinalhaven, Maine - the Hurricane Island Quarry, from The Commercial Granites of New England, Bulletin 738, by T. Nelson Dale, U. S. Geological Survey, 1923. 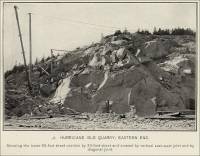 This quarry was “in the town of Vinalhaven, in the southeastern part of Hurricane Island.” The operator was the Hurricane Isle Quarries Co. of Rockland, Maine. The granite from the quarry was reportedly a pinkish-buff medium-gray color with a coarse texture. The Hurricane Island Quarry was opened about 1876. In 1905 the quarry measured “500 feet along the rift and had an average width of 150 feet. The quarry was on the south side of a ridge 100 feet high with a west-northwest axis. The greatest depth of working face was 105 feet and its average about 50 feet.” Transport of the granite was by track 400 feet to the dock. At the time of the report, the quarry was abandoned. The granite from the Hurricane Island Quarry was used for both buildings and monuments. Waste waste was used for paving blocks. The following are examples built from the granite from this quarry: the Suffolk County courthouse, Boston, Massachusetts; St. Louis post office and customhouse; two buildings for the Naval Academy at Annapolis, Maryland. Vinalhaven, Maine - the Indian Creek Quarry, from The Commercial Granites of New England, Bulletin 738, by T. Nelson Dale, U. S. Geological Survey, 1923. This quarry was “on Indian Creek in the township of Vinalhaven, about half a mile from Vinalhaven village.” The operator was J. Leopold & Co., 233 Broadway, New York. Granite from the quarry was reportedly a light-gray with a medium grain. The quarry opened in 1909. The granite from the quarry was used exclusively for curbing and paving. Vinalhaven, Maine - Islands of solitude: Maine havens off the tourist path, by Christina Tree, Globe Correspondent, The Boston Globe Archives, August 23, 1998. Vinalhaven, Maine - the Palmer Quarry. Vinalhaven, Maine - the Columns of St. John the Divine Cathedral - "St. John Divine columns got their start in Maine," By Associated Press, in the Portsmouth Herald, Portsmouth, NH, Thursday, December 20, 2001. This article is about the fire that damaged a part of the Cathedral in December 2001. Vinalhaven, Maine - Paving-Block Quarry at Vinalhaven. Vinalhaven, Maine - the Pequoit Quarry, from The Commercial Granites of New England, Bulletin 738, by T. Nelson Dale, U. S. Geological Survey, 1923. This quarry was "in the town of Vinalhaven, 1 1/2 miles east-northeast of Vinalhaven village, on Vinalhaven Island." The owner was Booth Bros. & Hurricane Isle Granite Co., 208 Broadway, New York. Granite from this quarry was reportedly a medium-gray shade with a fine texture. Transport of the granite was by cart one-third mile to the narrows and shipped from there. The Pequoit Quarry opened in 1887. In 1905 there were two openings. Each of the openings were about 250 feet square with a depth of 10 feet. The quarry only produced granite paving blocks in the sizes 10 to 14 by 4 to 5 by 6 to 7 inches. 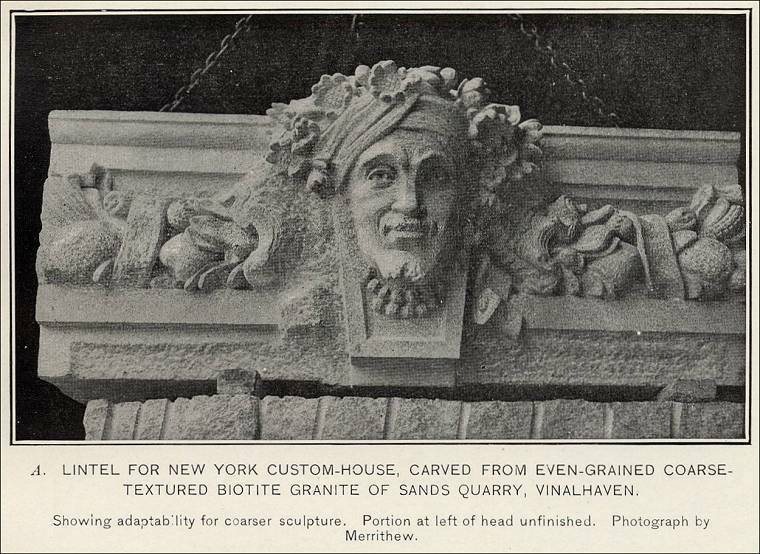 Vinalhaven, Maine - Sands Quarry - Lintel for New York Custom-House. Vinalhaven, Maine - the Webster Quarry, on Pleasant River, at End of Winter Harbor, Vinalhaven. Vinalhaven, Maine - Paving-Block Quarry at Vinalhaven. A "Motion." 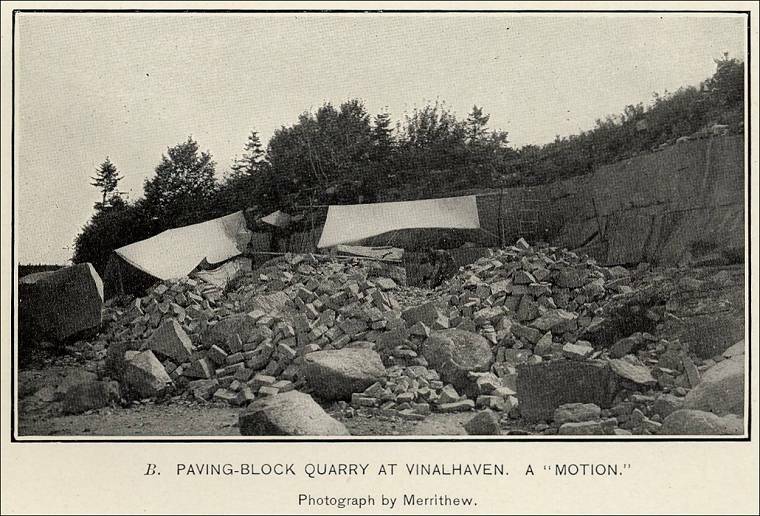 Vinalhaven, Maine - A typical Maine Paving-Block Quarry, called a "Motion." 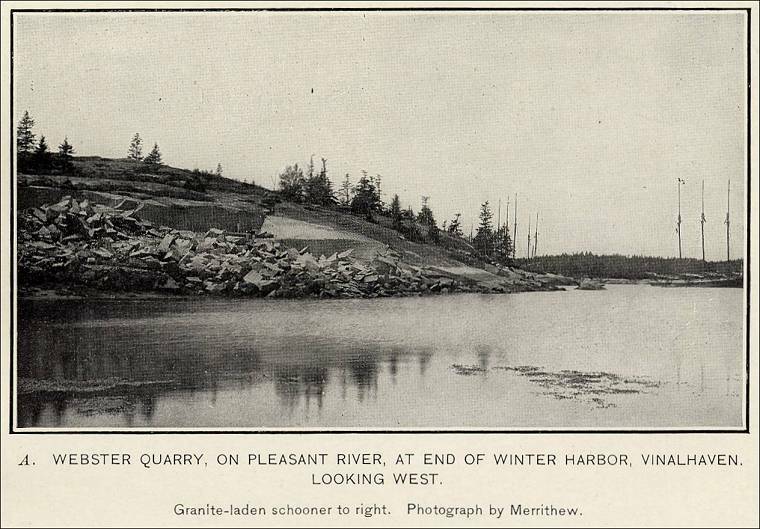 Vinalhaven, Maine - the Palmer or Wharff Quarry, from The Commercial Granites of New England, Bulletin 738, by T. Nelson Dale, U. S. Geological Survey, 1923. This quarry was "in the town of Vinalhaven, on the west side, opposite Leadbetter Island." The operator was Bodwell Granite co. of Rockland, Maine. Granite from the quarry was reportedly identical with that of the Sands Quarry, except it was a little more of a pinkish buff with a slightly greenish tinge. Transport of the granite was by rail 700 feet to the wharf, "where the blocks (were) taken on schooners either to the cutting sheds at the Sands quarry or directly to market." The Palmer or Wharff Quarry opened in 1896. In 1905 the quarry measured about 500 feet square and had an average depth of 25 feet. "The quarry (was) on the west side of a ridge 100 feet high." The quarry was idle in 1922. Granite from this quarry was used mainly for bridges and buildings. The waste was cut into paving blocks. This quarry, in addition to the Sands Quarry, provided granite for the New York customhouse. Granite from this quarry was used the following examples: the Chicago & Northwestern Railroad station in Chicago, Illinois; the State Savings Bank in Lansing, Michigan; the West Street Building (two stories polished), the United Realty Building, 115 Broadway, and 97 percent of the main piers (above foundation) of the Hell Gate Bridge in New York. 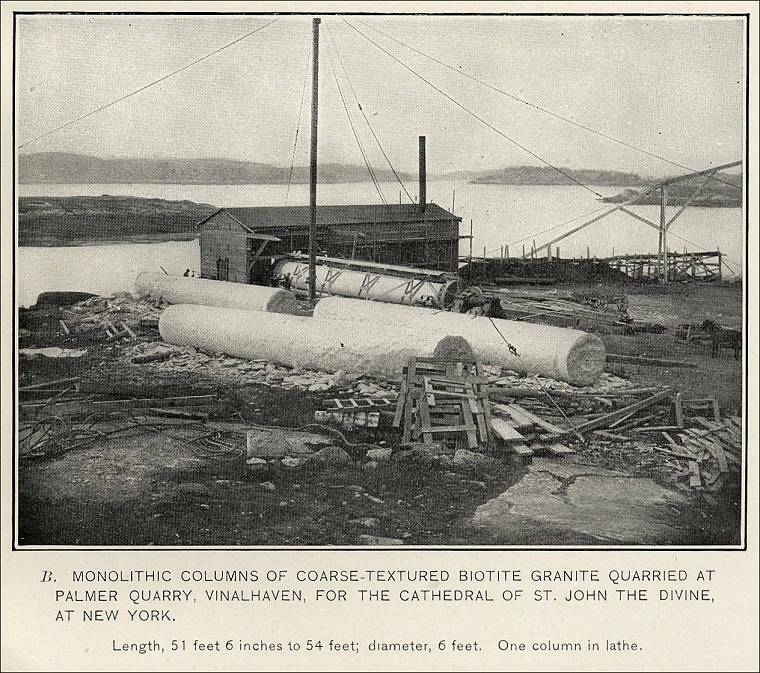 The quarry also supplied eight columns (51 1/2 to 54 feet long by 6 feet in diameter) for the Cathedral of St. John the Divine in New York. The columns were each made in two sections. Vinalhaven, Main - the Sands Quarry, from The Commercial Granites of New England, Bulletin 738, by T. Nelson Dale, U. S. Geological Survey, 1923. This quarry was "in the town of Vinalhaven, at the northeast side of the head of Sand Cove." The operator was Bodwell Granite Co. of Rockland, Maine. Granite from the quarry was reportedly a pinkish-buff color with a coarse texture. The Sands Quarry opened before 1860. In 1905 the quarry measured about 500 feet northeast to southwest and about the same northwest to southeast and had a depth from 20 to 75 feet, averaging about 40 feet. The quarry was idle in 1922. Transport of the granite was by railroad 500 feet to the wharf, "which admits schooners and barges of 1,500 gross tons capacity." Granite from the Sands Quarry was used for docks, bridges, piers, buildings, and monuments. Examples are: the Post Office Department building in Washington; the Masonic temple in Philadelphia, Pennsylvania; the savings bank in Wilmington, Delaware; the Board of Trade building in Chicago, Illinois; the post office and customhouse in Brooklyn, New York; the General Wool monument in Troy, New York; the Manhattan Bank in New York. The Sands Quarry and the Palmer Quarry together furnished all the granite for the customhouse in New York. 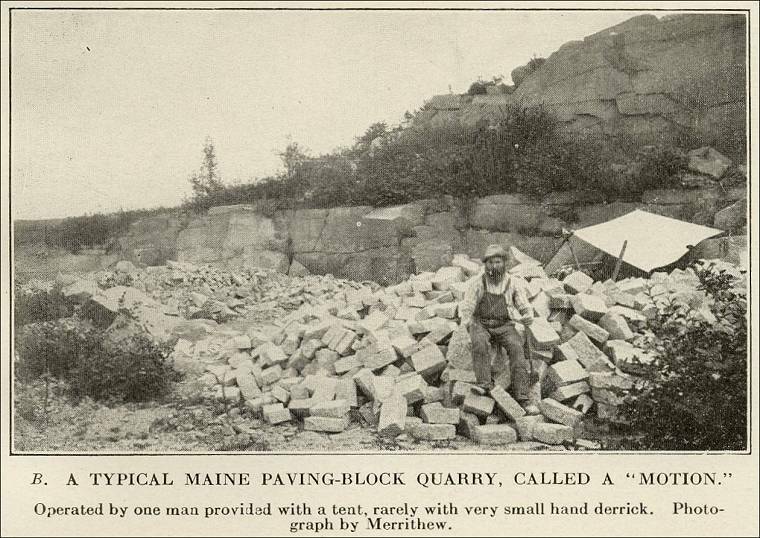 Vinalhaven, Maine – the Sands Quarry – “A Large Block of Stone,” Scientific American, July 5, 1879, pp. 3. You can view a photograph of the General Wool statue in the “John E. Wool” section of Wikipedia. Vinalhaven, Maine - Vinalhaven Granite Quarry (photograph), presented by the Penobscot Bay History Online. Vinalhaven, Maine - the Webster Quarry, from The Commercial Granites of New England, Bulletin 738, by T. Nelson Dale, U. S. Geological Survey, 1923. This quarry was located "in the town of Vinalhaven, on the north shore of 'Pleasant River' at the end of Winter Harbor, in the northern part of Vinalhaven Island." The operator was the A. M. Webster & Co. of Vinalhaven in 1905. Granite from the quarry was reportedly identical to the granite found at the Palmer Quarry. Transport of the granite was by "a graded track 200 feet to wharf admitting schooners of 300 to 350 long tons." The quarry was abandoned at the time of the report. The granite had been shipped in the rough to be used for buildings in New York and Boston. Vinalhaven, Maine – Vinalhaven Remembers its Great Age of Granite, by Charles Calhoun, Humanities, May/June 1998.